St Michael is one of what Arthur Mee called the Thankful Villages. These were the parishes which lost none of their young men to the killing fields of the First World War. If you consider that there are coming on for 20,000 villages in England, and all but 31 of them lost somebody, you can see why they might be thankful. St Michael is the only one in Suffolk; there are only two in all East Anglia, the other being at Ovington in Norfolk. The church sits in the fields at the end of a sharp-stoned track, where I got a puncture in the Autumn of 1998. Coming back ten years later, big-eyed cows watched me moodily as I pushed my bike up the track this time. All around the church are commons, which tend to push the houses away from one another, as if they were not talking. The church is pretty much all simple work of the 14th century. The graveyard is a pleasant place to wander, and the brick buttresses at the far end offset the east window nicely. The sundial on the south nave wall asks us Why Stand Gazing? and tells us to be about your business. The interior is full of light, and the brick floors are very pleasant. The character of the churches in the Saints is generally Low, but here there is a fine modern reredos depicting the East Anglian evangelists St Felix and St Fursey flanking the patron Saint of the parish, suggesting that in the middle of the 20th Century at least there was a High Church enthusiasm here. There are some lovely lions on the typically East Anglian font. Those on the bowl look introspective, even sorrowful, but the alert fellows guarding the shaft are smug and obviously proud of themselves. On my third bike ride around all the Saints, in 2008, I got to this church and the heavens opened. 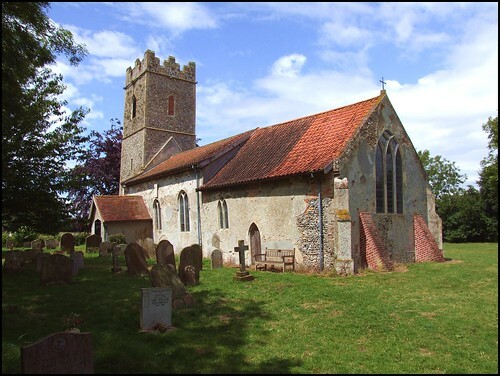 I was glad of the shelter it provided: when I had last come this way, the church had been kept locked without a keyholder notice, but today all the churches in this huge benefice are open and welcoming. I sat in the gloom, listening to the rain drum on the roof, and then suddenly the sun came out, flooding the nave and chancel with light. I knew outside there must be a rainbow, but I sat for a while longer, enjoying this beautiful, rustic interior. Before leaving, I had a look at the two handwritten rolls of honour on the north wall. There is one for each of the great conflagrations of the 20th Century. We have already noted that this parish lost none of its men in the First war, and the roll for the Second notes at the bottom All Returned Safely. Consequently, this tiny parish is the only one in all East Anglia without a war memorial.